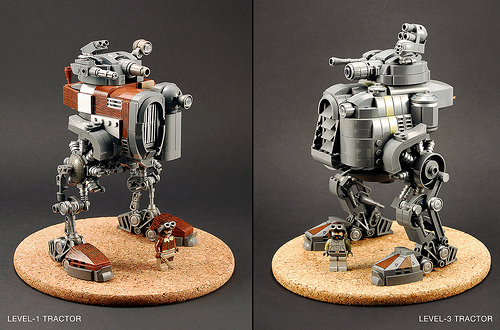 I’ve admired Captain Eugene‘s military LEGO models for a while, but I’d never noticed that he’s quite an accomplished mech builder. In fact, I nearly overlooked this pair of fantastic industrial robots because I thought from the thumbnail that they were plastic miniatures. And then I noticed the minifigs. I think that building military models gives you a very solid sense of the purpose that every mechanical detail has; greebles are great, but believable details trump greebs any day. It’s clear that Eugene has invested every detail in these two mechanical monstrosities with purpose, and that makes a huge difference. Absolutely stunning! This needs to be made into a complete series of builds. I could be wrong about this, but despite the use of the word “tractor,” these models appear to be military rather than industrial. I could find nothing in the builder’s flickr description that would support the conclusion that they were industrial. For example, according to this picture, (http://www.flickr.com/photos/26171295@N03/11356596975/in/photostream), the wood-sided version features a Gatling gun, mortars, and a heavy canon.